This labor day weekend, my mom flew to San Fran to visit us! We decided to make the most out of our last long weekend before school really started. 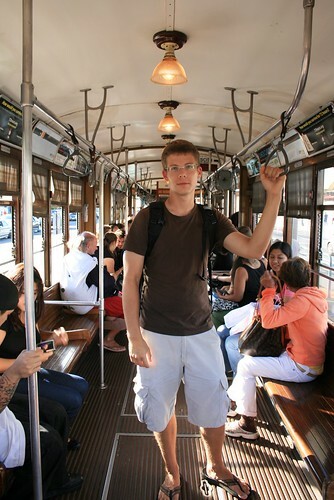 On Thursday, we went to down town San Fran and rode on the historic trolley cars. We had dinner at Fisherman's Wharf. We headed out on Friday in the bus from Oakland across the Bay Bridge. . . except we almost didn't make it over the bridge!!!! There was bumper to bumper traffic (since we left during rush hour) and all of a sudden, as we were approaching the middle of the bridge between San Fran and Treasure Island, we heard a huge and scary 'klump bump thump' from the transmission area. WTF!? So Romy stopped the bus in the middle of the highway traffic on top of the bridge! To make this worse, we were on an incline (since we were on the section of the bridge that lets boats go under it) and the e-brake was malfunctioning. So I had to put one foot on the brake, while Romy went under the bus. I kept my foot pressed down hard on the brake pedal, otherwise the bus would roll over Romy! So he got under the bus, all tucked under so that nobody would run him over on the highway. This was scary in itself, not to mention what he discovered under there. . .. . the driver's side half-shaft just fell off somehow on the transmission side! Thats the shaft that connects the transmission to the rear wheels. Its a mystery how it fell off. He also discovered that one of the ball bearings from the CV joint rolled out, but luckily it didn't roll far! It was still under the bus! So he shoved it back in, and then re connected the shaft to the transmission (part-way). It was messy, with all the grease getting all over, but we were able to drive away after about 15 minutes or so. It was a long 15 minutes. But we had a great view!!!! We exited right away as soon as we crossed the bay. We parked somewhere in down town San Fran, and Romy continued to reconnect the shaft properly. The threads got screwed up because of what happened, so luckily we had a tap of the correct size in the tool box, so Romy re-tapped the treads and screwed the shaft in securely. There were no problems after that. The fog was rolling in. It was actually pouring in between the slot between the mountains at the Gold Gate Bridge. Approaching the bridge, you couldn't even see it! When we got on the bridge, all you could see was 5 feet ahead of the bus. In fact, you couldn't tell you were on a bridge at all. The tall towers and suspension wires were within the thick stream of fog. It was like driving through a cloud. 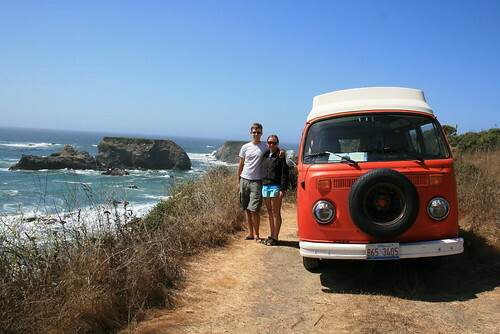 Once in the north bay, we got on Hwy 1 towards the ocean. It was getting dark now, and remained foggy the entire way to the Sonoma coast, where we camped at Sonoma Coast State Beach in the Noreaga Dunes campground. We got site #18 for the night. The fog was creating a mist in the air that hit your skin and made you shiver! It was so cold! But inside of the bus it was warm, and when we woke up, the fog slowly retreated to the ocean. We had coffee and breakfast in Jenner, a small town a little ways up Hwy 1 from the campground. The coast was lined with cliffs, and large rocks jutted out of the water near the coastline. At Jenner, there was a river which fed into the ocean, creating a calm pool area. 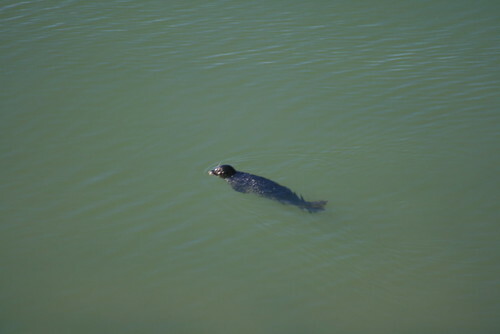 There were seals swimming and playing in the water! We then continued driving north, along the cliffs and mountainous rocky coast. We stopped along the way at some beaches and scenic places. We had lunch on a cliff-top where we pulled off of Hwy1. The sun was warm, with a cool breeze off the water. We cooked ramen noodle soup. It was spicy flavored (really spicy). Our goal was to reach the Avenue of the Giants. This is the area where Hwy1 joins Hwy101 in the Coastal Mountain range. This area has a lot of coastal redwoods. Avenue of the Giants is actually the old Hwy101, before they expanded it. It is a 32-mile stretch that runs along side the new Hwy101, but it weaves through old growth redwood groves, and literally lets you drive right past the giant redwoods. 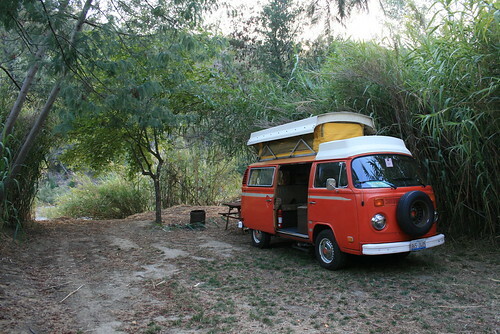 There are nice campgrounds all along this route, and we stopped at the Giant Redwoods RV Park in Myer's Flat. We made it to the campground around 6 or 7 pm, just with enough time to shower and make dinner (chilli and hot dogs) before it got too dark out. We didn't have wood to make a fire, so we just had some beer instead. The next morning, we woke up and drove to the northern end of the Avenue, and made our way south. Along the route, we stopped at some tourist attractions, like a redwood burl which was hollowed out to make a 20 ft high small room (it was once used as a gift shop). There were 3 drive-through sequoia trees, and even a "one-log cabin!" We didn't see the one-log cabin, but I assume its a hollowed out redwood or sequoia log that somebody made into a cabin. 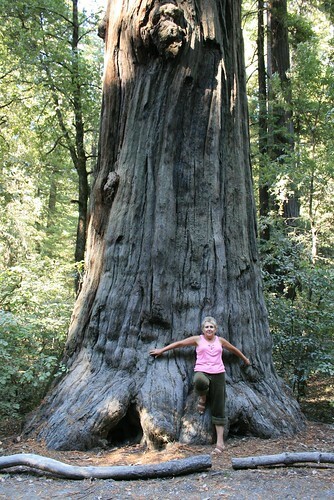 We also went to Humbolt Redwoods State Park and walked on a trail around the Founder Tree. We walked past trees over 300 ft high. The trunk diameters on some trees were over 12ft wide! Their circumferences were over 30ft around! It was a little breezy, and the tops of the trees were swaying slowly back and forth. It was softly snowing pine needles and other 'leaf litter.' Mostly is was quiet except for some creaking and birds. And it was like standing in a room with cathedral ceilings, except you were in a forest whose canopy was about 160 ft above your head. 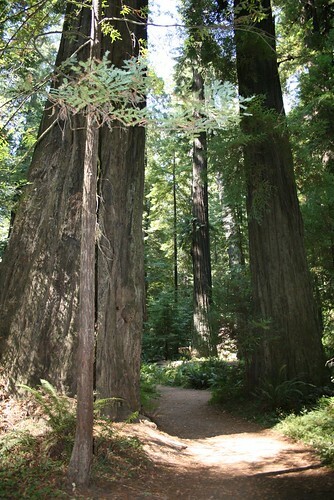 Below 160ft, there were just tall 'slender' trunks of the redwoods. That afternoon, we headed back south, back home. The ride back was a little boring, because we took Hwy101 the whole way, instead of the coast. But it was quicker. 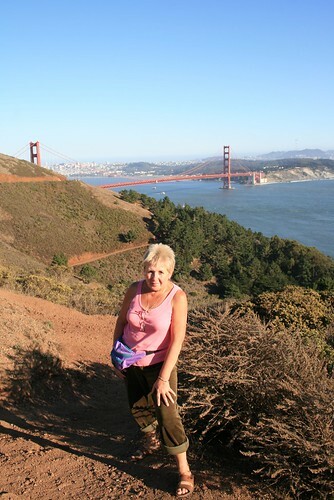 Once we got to the Golden Gate Bridge, it was all clear, so we stopped for a few pictures before crossing it. We happened to cross it on the last day before they hiked up the toll to $6! On Monday, it was really hot out, so we headed south towards Santa Cruz on Hwy 1. We went to the beach. It was windy, but we found a pocket of calm behind a dune. We all got partially burned, but the next day we were tanned. That evening, we grilled dinner in our backyard. Yummy yummy burgers!